Cutlery set made to have a romantic flavor. Our novelty spoon and fork set features a fork and spoon set with a hollowed heart design on each handle. 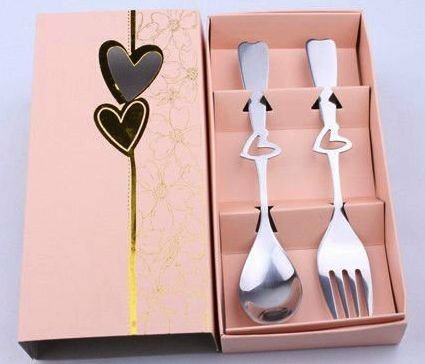 The fork and spoon set is gift package designed in beautiful peach pink and gold, especially beloved on special occassions as gifts or favors. Personalization Option: Make it extra special by engraving your names & date or short message on the handles of these cutlery sets to keep! Mention your message in the text fields for "Forks" and "Spoons". - Your items will be personalised with text or logos exactly as you present to us. - Includes 2 free drafts before engraving proceeds. - Please allow time (depending on quantity and complexity) for these to be arranged.